An increasing number of migrant workers are finding themselves homeless in Northern Ireland. Voluntary agencies have said there has been been a sharp rise in the number of foreign nationals seeking emergency accommodation. Sinead Devine who is in charge of the Salvation Army's night shelter in Belfast said numbers had doubled in recent months. "We can't offer beds to these men every night," she said. 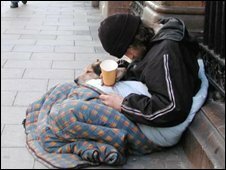 The exact number of homeless foreign nationals on Northern Ireland streets is not known. But charities and other voluntary agencies providing emergency housing said the increase was "substantial". On Monday, Social Development Minister Margaret Ritchie confirmed that the number of people deemed homeless on the Housing Executive's waiting list is more than 9,500. With the economic crisis and job cuts across many sectors, this is likely to get worse.